1. Eastern Ontario's Exciting Getaway Destination. Every year more and more people are finding Perth a great place to spend a weekend or a week. 2. Lots to see and do. 4. 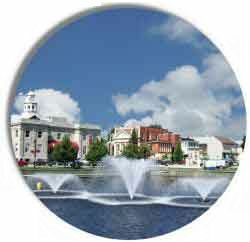 Historic Architecture, Perth Museum and Old World Charm with all the New World Conveniences. Friendly, helpful people. The little community that cares. 5. Beautiful scenery and wildlife watching. 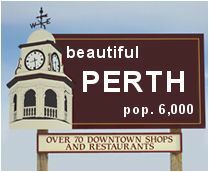 Day trips; 10-20 minutes to exciting and interesting sights, sounds and places in and around Perth. 6. Freshest air in Eastern Ontario - minimal noise. Open the window and sleep like you've never slept before. 7. Great food at the local restaurants ... the food tastes better out here. 8. On The Tay Canal just off the Rideau Canal. 9. Unique gift shops and shopping experiences await you in beautiful Perth. 10. The Big Town of Festivals: Maplefest, Stewart Park Music Festival, Garlic Festival, and the Perth Fair provide a major event each summer month.